We are coming up on what wedding experts call "engagement season." With that in mind, I thought we'd take a look at some trends. But not for brides - for bridesmaids! We've seen the ways in which brides are treating their bridesmaids more like individuals these days, by allowing them to be coordinated without being matchy-matchy. But what are some affordable ways to do that? Let's take a look at three popular ideas. 1) Allow the bridesmaids to choose fabrics and colors, and then have the dresses made by a seamstress or independent designer. 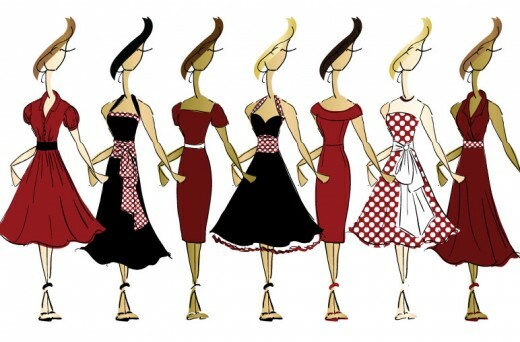 This way sounds like the most work but is the easiest way to customize the dresses and still have a coordinated look. 2) Get together and purchase color-coordinated bridesmaid dresses from a wedding shop, such as David's Bridal. This option allows you to see various colors and options while you decide if all the dresses will "play well together." 3) Buy the dresses off-the-rack. If you've seen really great dresses at a department store or some other boutique, you could pick up dresses for your bridesmaids in their sizes or even have them come with you to do it. I was in a wedding where the bride did this for us and we were very grateful to not have to worry about finding dresses. The only drawback to this might be that someone could receive a size that doesn't fit. But since everyone isn't going to match exactly anyway, it might be easy to find another dress. What do you think? Do you still prefer for bridesmaids to be more uniform? Have you seen any other ideas that worked? Let us know! Exclusive Trunk Show Just for our Readers! What's your "something bling" for your big day? No more standing in lines or buying a piece of jewelry that you will never wear again. Your day is about being special, unique, and memorable. Wouldn't it be great to own unique pieces you can't find at the mall or department store? To have your very own personal shopper? Maryann Reid, Author and Stylist for Stella & Dot (ID# 131438) is holding an exclusive Stella & Dot Jewelry Trunk Show just for The African American Brides Blog community! Starting Friday at 1pm ET you can start shopping your little hearts out. And there's more: Every buyer will be entered into a chance drawing to win up to $250 in Free Jewelry and 4 half-off items! There is also a Little Girls line to shop for flower girls, and the children of your friends. Your wedding jewelry should not just be for a day! You can transition any Stella & Dot piece from day to evening from wedding to honeymoon! They can become your very own treasures as you make them a part of your wardrobe or your go-to pieces for special times. Stella & Dot‘s luxurious, handmade pieces have been featured by Vogue, In Style, Lucky, Modern Bride, US Weekly, etc. Celebrities such as Paris Hilton, Rachel Ray, Ali Landry, and Penelope Cruz have been photographed wearing Stella & Dot jewelry. The View, Good Morning America, The Today Show, and more have featured Stella & Dot pieces, too! Check out all the press at www.stelladot.com/press. * Easy return and exchanges policy. * Lots of fabulous finds under $50! * Special flat-rate shipping of $5.95 for this online trunk show. So how does the FREE jewelry work? The actual amount is based on a percentage of the sales generated from this online trunk show. However, a typical trunk show generates $1,000 in sales, on average. If this online trunk show sells $1,000, that means the jewelry cash reward would be $250, that could be used towards any Stella & Dot jewelry!!!! Sharing is caring! Spread the word and the excitement of this online trunk show to your friends, family, neighbors, and co-workers!! Send them the link to this blog post asap. 2) Shop to your heart's content (keep moms, aunties, and others in mind, too) for your wedding day, honeymoon, reception dinner, you name it! 3) At checkout, choose "African American Brides Blog" trunk show for the special flat $5.95 ship rate! Done! You will receive a confirmation email about the order and tracking info when it ships. Delivery usually takes only 5 business days! Feel free to forward www.stelladot.com/maryann to friends who may want to purchase something, too. Next Sunday, Nov 13, the WINNER of the FREE cash Jewelry and discount items will be chosen!!! The winner will be announced on the blog, so make sure you all check the blog on Monday for the announcement. How do you get the FREE jewelry? The winner can get their FREE jewelry in a few ways 1) winner will get email to set up their online account and begin their shopping or 2) place an order directly with me via phone or email. Easy! Shipping and tax are not included. What do you do now? Take a sneak peek at the jewelry at www.stelladot.com/maryann. Bookmark the page, and set a reminder for the trunk show! Everyone gets something great, valuable, luxurious jewelry with the added bonus of a chance at getting plenty more for free! No losers, here!